Of all the founders of the Grand Prix Drivers Club Gianfranco, Alessandro, Maria, “Franco” Comotti probably led the most colourful career, not only in racing but during World War II. Born in Brescia in May 1906 he started racing at the age of 22 and ran a Scuderia Materassi Talbot in the 1928 European Grand Prix at Monza however it was in 1933 that he came to everyone’s notice with an Alfa Romeo 2500. The previous year he had married Anna Maria Peduzzi who was to become one of Italy’s best known racing drivers. When Franco bought the 6C 1500 GS Zagato Alfa Romeo he and his wife. They both raced the car and had it serviced in Modena at Scuderia Ferrari. 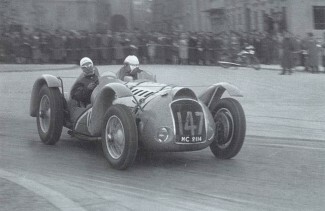 This led to Anna-Maria and her Franco being entered by Scuderia Ferrari for the Mille Miglia. They won the 1500cc Class in that event and Anna-Maria became the first woman to race under the Scuderia Ferrari banner. With the Alfa Franco Comotti won the 1934 Comminges Grand Prix but was concerned by the rise of Mussolini so that in 1936 he and Anna-Maria moved to Paris. He had already done some test driving for Talbot and in 1938 raced at Le Mans in a Delahaye. Then came the mysterious part of his career as he moved back to Italy in 1944 and acted as agent to the allies. He was captured and faced the death sentence but was freed. After the War he worked in the oil industry but along with his wife was still keen to race. Thanks to his French connections with Talbot he was entered for the 1948 Monaco Grand Prix in a Talbot 26C but had to stand and watch as the car was not ready in time. He then was reserve driver to Louis Rosier in a Talbot 150C at Montlhery and eventually had his first post-war grand prix at San Remo in June 1948 driving his Talbot 26C. He qualified alongside his friend Rosier but retired after hitting another car. At the European GP at Bremgarten in Switzerland he again retired this time with a broken oil pipe but in the French Grand Prix at Reims he was loaned one of the new Lago-Talbots not only qualified on the third row of the grid but finished 4th in the race. At Albi he qualified second fastest behind Villoresi’s Maserati in one of the heats but in the final he only managed to finish 10th. Back in the Talbot-Lago for the Italian Grand Prix he finished seventh and led to him being invited to race a new Maserati 4CLT/48 in the Grand Prix of the Monza Autodrome. His friend Jean-Pierre Wimille was killed in this race and Comotti retired. He did little racing in 1949 save for a run in a Maserati A6GCS in Bari and the Autodromo di Monza. In 1950, the first year of the Formula 1 Championship, he was signed to race with Scuderia Milan alongside Felice Bonetto. 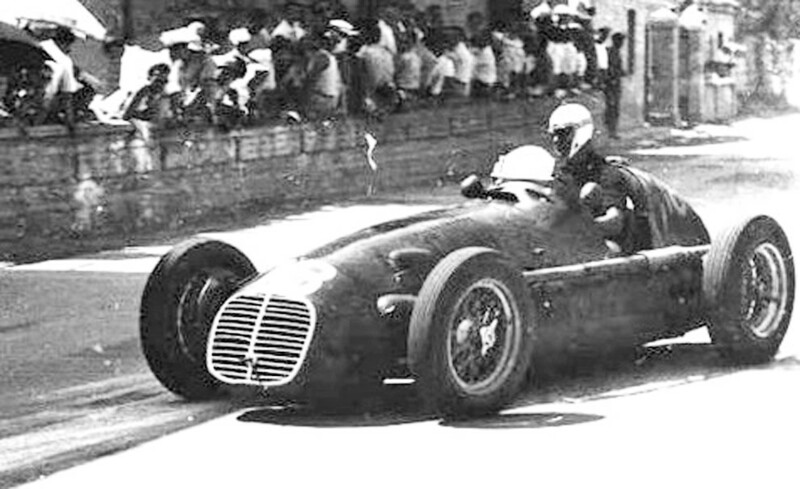 Scuderia Milan was run by the Ruggieri brothers and wished to develop their own racing cars partly because prior to the 1949 Italian Grand prix a financial prize was offered to any “new” Italian grand prix cars. Using two Maserati 4CLT/48 chassis they approached Mario Spelluzi a Professor in the Milan Polytechnic who had developed two single stage supercharged Maserati engines with two-stage supercharging which had increased the power considerably;. Comotti and Felice Bonetto were to be the drivers in Geneva and though Bonetto qualified just behind Piero Taruffi’s 158 Alfa Romeo Comotti started further back on the grid. Sadly Comotti retired and Bonetto was so far behind he did not qualify as a finisher. 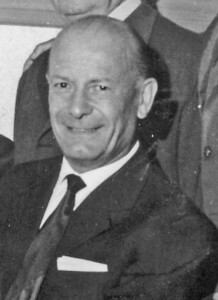 Franco Comotti’s final major race was back in Monza in June 1955 for the GP Autodromo di Monza. On this occasion his friend and former member of The Grand Prix Drivers Club, Gianino Marzotto entered him in a Formula 2 Ferrari 166. Again he proved that given a good car he could compete with the best and placed it on the fourth row of the grid. However it was all in vain as the engine blew up after six laps. By now Comotti was spending most of his time in North Africa working with BP and in 1962 became one of the original founders of the Grand Prix Drivers Club but he sadly died a year later.